Karstejn is a nice break from the hectic big city. This is where the Czech crown jewels used to be kept. It is easily reached by local rail and by car. The train ride is fairly short about 35 - 40 minutes. Being so close to Prague makes it the most visited castle in the Czech Rep. Not only the castle is worth seeing for its unique history but also the Carriage ride or small shops under the castle make the experience worthwhile. Before I tell you how we spent a day there with our 2 small kids here is a bit of information on the castle itself: The castle was built by the Czech King and Roman Emperor Charles IV as a place for safekeeping of the royal treasures, especially Charles’s collection of holy relics and the coronation jewels from the Roman Empire. ´As you may know King Charles VI was very important to the Czech Republic, He brought lots of valuable knowledge to the whole country and built many famous monuments. This Gothic castle which is towering above the Berounka river on a huge limestone rock, has a unique position among all Czech castles due to its historical significance, robustness and architecture. Already when you are coming close and you see it for the first time it takes your breath away. The area surrounding it is very scenic—rolling hills and fields, and surrounding the castle is a beautiful nature preserve. It can be quite busy, with shops selling the same China/India manufactured trinkets like anywhere. However, it’s still a slower pace than Prague, and tourists almost disappear by afternoon/evening. Also not all shops sell souvenirs made in China some stock wooden Czech art Craft.There are numerous restaurants with reasonable prices, I was a bit disappointed with the restaurants. The majority of them had only Czech food or pizza. The place we eventually stopped at was a good restaurant in front of a hotel named Koruna. The approach to the castle is long and steep.People with health or other physical limitations are forewarned. Having two little boys with us and a pram we gave up on walking up the hill and took a carriage from the car park. A very good decision indeed and not only were the kids thrilled but we enjoyed having a great view of all the little shops and attractions that were awaiting us on the way back. We had to wait a while for the carriage to fill up. The charge is 800CZK which you share with the other passengers, otherwise if we went alone we would have to pay the whole price so waiting 10 min cut the price to half. You can’t enter the interior of the castle without a guided tour, but it’s worth the $16-23 (adult) charge. It offers great views of the surrounding area and is well-preserved. After visiting the castle, enjoy the surrounding nature reserve and take a walk down the hill. It’s is quite enchanting to visit the little shops with souvenirs. We also had a chance to get closed to an Eagle with his master dressed in historical clothes. Sure - you have to make a contribution if you want to take the picture. But, the money goes towards saving the predator birds that have fallen out of the nest or lost their parents. Eventually they are either returned to the wild nature or find home with professionals who look after them. There are some interesting sites only 2-5 km walk from the castle, including Little America, a deep canyon with a lake at the bottom. If you take a walk, watch the signs very carefully. The trails are not marked very well, but if you careful you’ll manage. 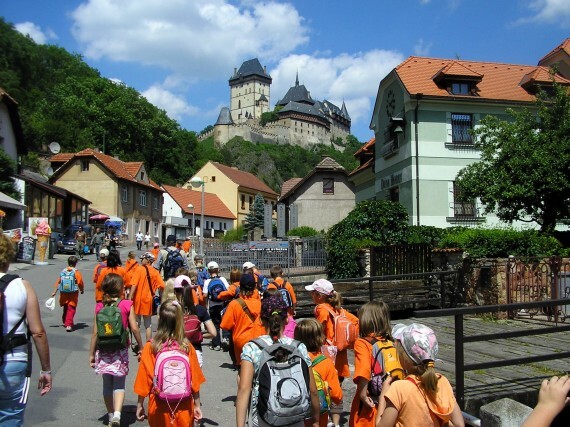 There was a time when no women were allowed in Karlštejn – this rumour goes around to this day and quite a lot of people are prepared to believe it. Indeed, it was confirmed in Vrchlický’s comedy Noc na Karlštejně (Night in Karlštejn) - one of the most popular Czech musicals. It is not true, however. Women were allowed into Karlštejn the same as any other castle. The confusion arose in the 16th Century when Václav Hájek of Libočany made reference in his chronicle to Karlík Castle. This stood nearby and, according to Hájek, served as accommodation for ladies paying daytime visits to their husbands in Karlštejn. 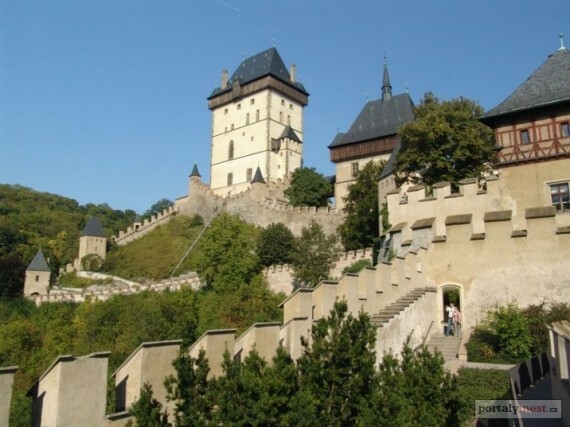 The truth can be found by studying the castle charter, where it states: “This document permanently forbids anyone to sleep with, or lie with a woman in the tower of the castle of Karlštejn, in which the chapel is to stand. Women could move freely around the castle, they were only denied access to one floor of the Great Tower where the guards of the valuable treasure were stationed. I cannot skip piquant information about the Castle. The most horrible story of all is actually based on true events. In the 16th Century Kateřina Bechyňová, the wife of the Burgrave, resided in the castle. She was responsible for the heinous murder of fourteen people. This sadistic lady abused young servants and pageboys. Even animals were subjected to her rage. A maid who failed to carry out her orders immediately was thrown into the dungeons to starve to death. When a cat tore a lace skirt with its claws she had the animal skinned alive. The Prague Chamber Court was eventually informed of her activities and Kateřina Bechyňová was sentenced to death by starvation. Two days after the death of Kateřina Bechyňová the chairman of the Chamber Court died suddenly – could this have been the last victim of the Murderess of Karlštejn? 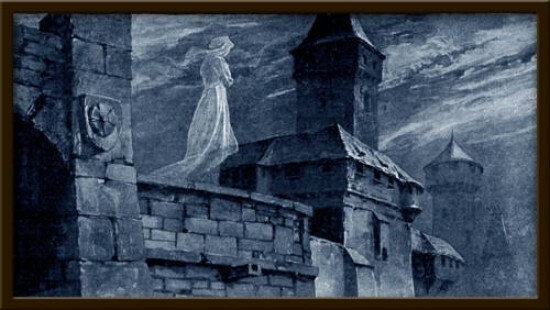 The ghosts of murdered maids are said to haunt the castle to this day as White Ladies. If you can - take bikes. You will have a great ride in beautiful nature.